Striated by sun, shadow and geology, a wilderness of high desert stretches eastward along the Masar Ibrahim, or Abraham’s Path, from near the village of Rashayida. For students: We hope this guide sharpens your reading skills and deepens your understanding. For teachers: We encourage reproduction and adaptation of these ideas, freely and without further permission from AramcoWorld, by teachers at any level. Common Core Standards met in this lesson: RI9-10.2/W9-10.4 (see details below). Do you have comments? I'd be pleased to hear from you at [email protected]. Describe your own walking habits and the meaning you attach to them. Identify and explain how different factors affect walking and the connections people place on a place. Evaluate the assertion that walking contributes to identity among Palestinians. Think about your own walking habits. Turn a piece of paper landscape into a timeline. Start the line at the time of day you usually get up and divide it into hour-long increments until whenever you generally go to bed. Take a few minutes and go through, in your head, a typical day. Mark each hour you usually walk and for what purpose. Here are a few questions prompt your thinking: Do you walk to school? Or to a bus stop? Do you walk in order to exercise? Do you walk a dog? Do you walk places alone or with friends? To get to a destination or just as a way to hang out? Just for the fun of it? Do you walk city streets? Wooded paths? Beaches? On a treadmill? When you are done with the timeline, write a short summary about walking in your life—when and why you walk and what it means to you. As you complete the rest of these activities, think about ways that walking does and/or doesn't contribute to your sense of who you are and your connection to where you live. Walking as a physical activity is rather consistent: you put one foot in front of the other. What that physical movement means, however, is more complicated. As you've seen from reflecting on your own walking habits, walking can have many different meanings. You'll see the same is true among Palestinians. Read "Hike Palestine." As a class, discuss the following questions to clarify your understanding of the article and to spark your thinking. According to the article, for what reasons do Palestinians walk? For what reasons did they walk in the past? What do sarha and shattha mean, and what do the words reveal about the meanings of walking for Palestinians? Why is it significant that there is no Arabic word for hiking? How might the experience of walking be different for someone doing it for pleasure than for someone walking as a means of transportation? 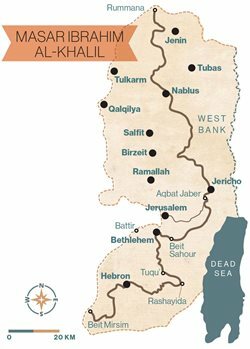 "Hike Palestine" identifies obstacles to walking—linguistic, geographic and political. 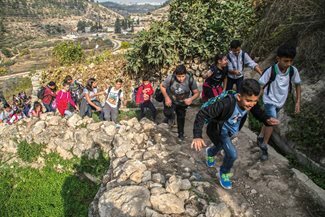 As a class, define each type of the three types of obstacles and explain how each impedes the creation of pleasure-walk tourism in Palestine. Despite the obstacles, there are those who have been reintroducing the idea of walking for pleasure in Palestine. Why? Find and highlight the statements in the article that assert that walking enhances a connection to place and alters a sense of identity. Then, let's look closely to see what information the article presents to support the assertion. Start with the Masar Ibrahim, Abraham's Path. There is no record that such a path ever existed, at least not until some people decided to create it. What may be surprising is who those people were. Specialists in negotiation strategy aren't necessarily the ones you would first think of if you wanted to make a hiking path. Why do you think the strategists were called upon? Under their guidance, how did the path take shape? How does its very creation support the theory that walking can affect identity and relationship to place? Are you convinced? Why or why not? What about the Sufi Trail? How was it created? How does the trail existence affect the people who live near it? Would you agree or disagree that the Sufi Trail contributes to a sense of identity and helps forge a relationship to a place? Support your answer with evidence from the article. Local youth take a day hike along one of the many historic rural paths integrated into informal trail networks. This one leads to Battir, a few kilometers southwest of Jerusalem. It's one thing to create walking paths, but it's another for people to use them. Palestine is a place where locals rarely walk for the fun of it; nor is it a place that many foreigners think of as a hiking destination. "Hike Palestine" makes a distinction between attracting local pleasure walkers and drawing pleasure walkers away from it. Divide the class into small groups With your group, create two different advertisements—one intended to draw the locals. As you shape each ad, think about what you've already explored about the meanings of walking, the obstacles to walking, and walking and identity. When all the groups are done, share both of your ads with the entire class. What do you notice about the different pitches you and your classmates have made to local tourists and tourists from afar? Discuss which pitches you find most persuasive and why. With the benefit of you've thought about in these activities, return to the timeline you made before you read "Hike Palestine" and reflect on your own walking. Write a statement that completes and responds to this prompt: For me, walking ... If you need another nudge, think about these questions: Is walking an important part of how you know your surroundings? How, if at all, does walking around where you live affect your sense of belonging? RI9-10.2 Determine a central idea of a text and analyze its development over the course of the text, including how it emerges, and is shaped and refined by specific details; provide an objective summary of the text. W9-10.4 Produce clear and coherent writing in which the development, organization and style are appropriate to task, purpose and audience. Julie Weiss is an education consultant based in Eliot, Maine. She holds a Ph.D. in American studies. Her company, Unlimited Horizons, develops social studies, media literacy, and English as a Second Language curricula, and produces textbook materials.